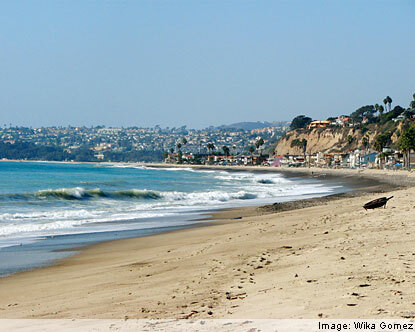 San Clemente State Beach - Popular with surfers on the north end of the one-mile beach. Other popular activities are skin diving and hiking along the trails on the bluffs. The beach has a landscaped bluff top with picnic areas. Trails lead down to the beach, which is also popular for body surfing, swimming, and skin diving. San Clemente Pier - Popular favorite among the locals and the center of many local community events, including the annual San Clemente Seafest. Favorite activities include surfing and fishing. San Clemente North Beach - This beach is popular with San Clemente residents because it's not as crowded as the other beaches. It's located next to the Ole Hanson Beach Club in North San Clemente. Doheny State Beach - Doheny State Beach is two parks in one - with camping in the southern area and day use in the northern area, where there is a five-acre lawn with picnic facilities and volleyball courts. Surfing is popular, but is restricted to the north end of the beach. Salt Creek Beach Park - Salt Creek Beach is a popular surfing location. A small, offshore reef creates some of the best left swells along the entire coastline. Swimming, body surfing, sunbathing and tidepool exploration are other beach activities. Three Arch Bay - One of the most beautiful as well as historic portions of our beautiful Orange County coast, as well as the site for the filming of many Hollywood films. These inviting coves and the beautiful Whale Island make this one of Orange County's most scenic places. Shell Cove is particularly known for seashell hunting. 1000 Steps County Beach - There aren't really a thousand steps, it just seems like it by the time you've hiked up them all. The surfing is great and the beach is relatively uncrowded (probably due to the stairs you have to climb just to get there). The beach is partially rocky with many tidepools for exploring. Aliso County Beach Park - Features sandy beaches, rocky promontories, and scenic coastal foothills. Swimming, surfing, skin diving and paddle boarding all take place in the waters off Aliso. Fishing is also a popular pastime. Laguna Beach - Perhaps one of the funnest beaches in the County. The Beach is across the street from downtown Laguna Beach. Swimming and Vollyball are popular activities. This beach is probably most famous for the wooden boardwalk, a favorite among Orange County romantics. Crescent Bay - Activities include skin boarding, volleyball, skin and scuba diving, and is in fact a favorite spot for divers in Orange County. Seals and sea lions playing on Seal Rock are a popular attraction at this local favorite. Crystal Cove - The beach is popular with swimmers and surfers. The offshore waters are designated as an underwater park and it is a favorite of scuba and skin divers. Visitors can also explore tidepools and sandy coves. Little Corona Beach - A relatively small beach, flanked on both sides with rocky reefs that offer the spectacular diving well known to local divers, this beach is well protected from swells and surf, making it one of the easier diving sites. There are no steps, but there is a steep pathway to the beach. 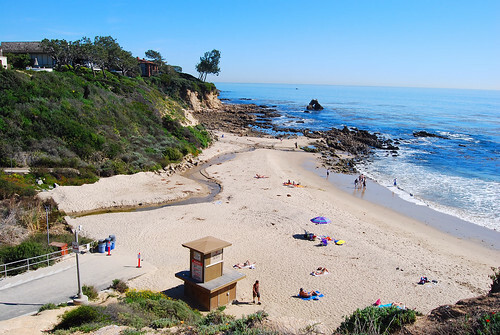 Corona Del Mar - Corona del Mar State Beach is a popular place for swimmers. The half-mile long sandy beach is framed by cliffs and a rock jetty that forms the east entrance to Newport Harbor. The beach is also popular with surfers and divers. Balboa Pier - The locals of Newport Beach will tell you that the beaches of Newport aren't just beaches, they are a way of life. And of all the beaches on the Balboa peninsula, the Balboa pier is by far the most famous. A popular walk, or swim, is between the 2 piers (2 miles). 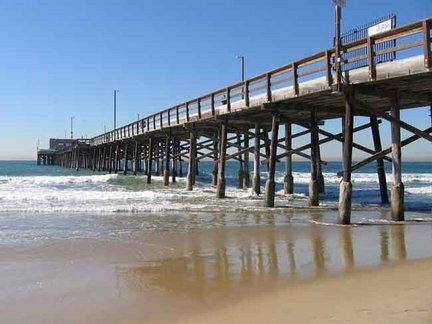 Newport Pier - This is a very nice wooden pier in Newport Beach, excellent for romantic walks. There is a popular sushi restaurant at the end of the pier, and on a clear day, you can get an exceptional view of Catalina. Swimming, surfing and diving are all popular at this beach. 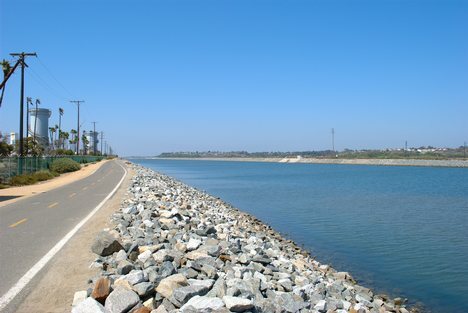 Santa Ana River - This beach is at the very northern end of Newport Beach right next to where the Santa Ana River dumps into the Pacific Ocean. Popular with surfers and divers. This beach tends to be less crowded than many of the others, so is a great place if you're looking to avoid crowds. Huntington State Beach - The Site is a nesting sanctuary for the California Least Tern, a rare and endangered species, and for the threatened Snowy Plover. The park features a bicycle trail, surfing, skating and surf fishing. The park contains rings for bonfires. The beach is two miles long and extends between Magnolia Ave. and Beach Blvd. Huntington Beach Pier - This is the home of the original surfer. Huntington Beach was not named "Surf City" for nothing. To see all the action, you'll find it here. This is definitely a busy and fun beach. Right across the street from the Main Street shops and restaurants. Huntington Beach - This is one of the most famous beaches in the world. You've seen it in the movies, and you have heard the Beach Boys sing about it. This beach is why Huntington Beach is "Surf City". Popular things to do besides surfing, just about anything you can do on a beach. Bolsa Chica State Park - You've heard of the famous Southern California Grunion runs! This is where you will find them. Bare-handed fishing for the grunion is a popular summer event. Perch, Corbina, Croaker, Cabezon and Sand Shark fishing are also popular. Wildlife and bird watching are equally popular. Sunset Beach - Traditional water related activities such as swimming, body and board surfing are common. 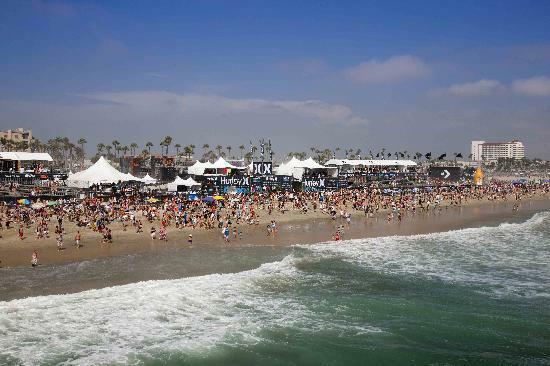 A surfing zone is provided and controlled by the "black ball" flag system. Lifeguard service is provided. Surfside - Very popular and very crowded surfer beach. 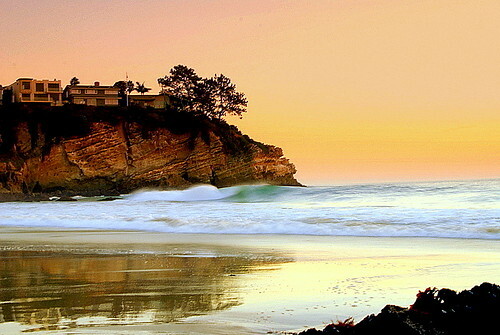 One of the most popular surfing locations in Orange County. Great place for building sandcastles.